Wait a sec. Hold that thought. Every self-respecting squirrel knows that before you can snuggle in for chilly weather and page-turners, you have to stock up! And boy is this the week to do it. 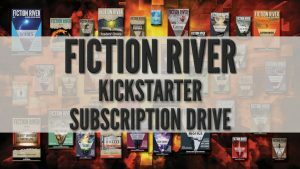 Our Fiction River Subscription Kickstarter is ticking down to its final hours. Guarantee yourself dozens of gripping stories by award-winning authors by subscribing to electronic and/or print editions. We have hit six of our stretch goals so far, which means more books for all backers at $15 or higher. And now, for writers, or those of you with family or friends who are writers, we added a new reward at the $100 level. Lectures, writing books, subscription, and a chance to submit a story to Fiction River. Some of you—a record number, in fact—had the foresight to squirrel away (preorder) Kristine Kathryn Rusch’s latest novel in the award-winning Diving Series. 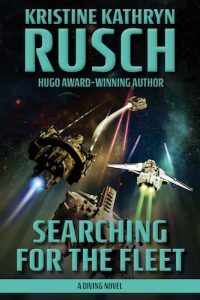 The wait is over: Searching for the Fleet, arrives this week! September 18, get your copy from your favorite book retailer. It is available in paperback, too. Planning on bundling up in front of a crackling fire? What better way to provide yourself with hours of uninterrupted absorption than indulging in a Storybundle. Dean Wesley Smith’s novel Dry Creek Crossing from his time-travel Thunder Mountain series and Kristine Kathryn Rusch’s novella The Application of Hope from her Diving series are both part of the 2018 Adventure SF Bundle. There is much more to the bundle: Kevin J. Anderson’s anthology of science fiction stories; Fiction River: Superpowers; thirteen works in all. But it ends Wednesday, September 19.